*This article originally appeared in print and online in the Pensacola News Journal on Feb. 7, 2018. For many, Mardi Gras is about letting the good times roll, but Pensacola krewes hope to start a new tradition of partying with a purpose. 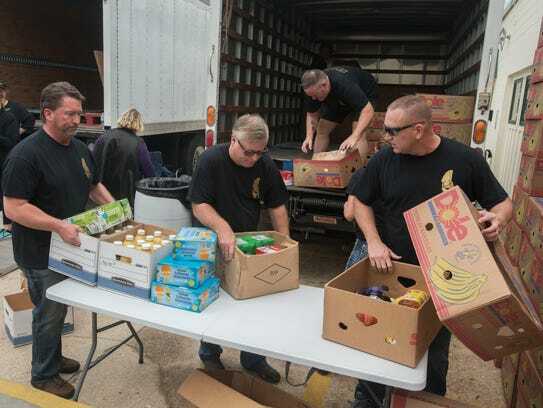 Over the last year, 21 krewes have collected 28,494 pounds of food — enough for 21,369 meals — for the seventh annual All Krewe Humanitarian Award Food Drive Challenge, hosted by the Krewe of Sparta. Krewes dropped off donations Jan. 28 at the Pensacola Parade People location, weighed them and loaded them onto a truck to be taken to Manna Food Bank’s main pantry at its new location on North E Street. DeDe Flounlacker, executive director of Manna Food Bank, said the organization does a great job during the holiday season supporting disadvantaged individuals in the area, but supplies become depleted at the start of the year. That makes the all krewe challenge especially important. This year’s drive surpassed the original goal of 25,000 pounds of food and greatly exceeded the previous year’s donation of 18,415 pounds. In 2017, Manna supported 20,269 people in the community. Of those, 42 percent of clients were children and 25 percent were senior citizens. “We wanted to do something to give back to the community where it wasn’t all about Mardi Gras and just having fun,” she said. Jimmy Hendrix, another Krewe of Sparta coordinator, has been involved with the annual event since 2012 when the Krewe of Blues became the first challenge winner of a 4-foot trophy. “We’re trying to make Pensacola Mardi Gras different from other cities. We have a lot of fun, but we all want to give back,” Hendrix said. 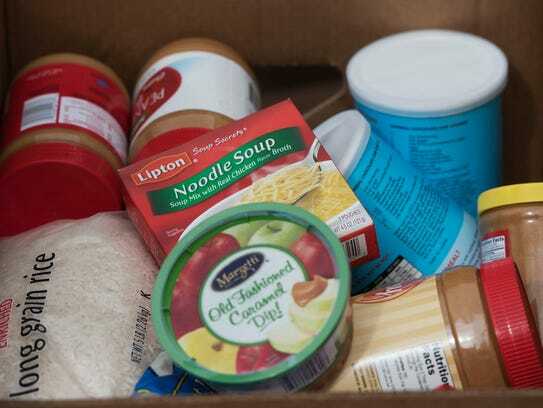 Manna provided krewes with a list of high-protein items that are most needed such as peanut butter, canned tuna and canned fruit, which, Flounlacker said, is always in short supply. Each group collected in different ways. Krewe de Bon Amis partnered with Winn Dixie and Walmart throughout the year in collecting donations. Krewes gained points per donation collected. Double points were given for 100 percent fruit juice, fruit canned in juice and canned chicken. 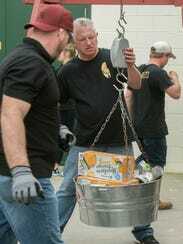 This event has become Manna’s third most successful food drive, following collections by Mayflower and the U.S. Postal Service. “We had a lot more participation this year with people helping us. We’ve got to up our game next year. We can’t go backward,” said Hendrix, who is always looking to for more volunteers. The winning krewe of the food drive challenge will be announced Feb. 13 during the Pensacola Mardi Gras Fat Tuesday Priscus Celebration at Seville Quarter. For more information on donating food supplies or volunteer opportunities, visit MannaHelps.org.